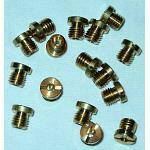 Article Info - Carburetor Parts & Rebuild Kits - Carburetor Parts Superstore! Where are my Carburetor numbers? Use this chart to locate where your carburetor ID numbers are located. Generally the carb #'s were either STAMPED into the carburetor casting or there was a metal tag attached to a carburetor screw. Unfortunately, in many cases the metal ID tag is missing. Some carburetors originally came with both a tag and stamped numbers in the carb body and sometimes the stamped carb number is not complete but it can still be helpful to ID the carb. It is very important to identify your carburetor by its carburetor number in order to ensure you are getting the correct replacement part or carburetor rebuild kit. My carburetor does not have a metal tag or stamped number on it anymore. What rebuild kit should I get? In this case, the best solution is to disassemble your carburetor. (Take plenty of digital pictures to identify where everything goes) Compare your gaskets with the detailed pictures of our carburetor rebuild kits to identify which rebuild kit matches your carb. I found other numbers on my carburetor, what are they? Numbers that are cast into the part are known as casting numbers and are of little value in identifying your carburetor since the same casting numbered component was modified to produce different carburetors. Identification number will be stamped on the front of the choke tower. It will start with the letter R followed by 4 or 5 digits, or it will start with the word LIST followed by 4 or 5 digits. 1965-67 Quadrajets has carburetor number located on a round aluminum disc glued on driver side, next to Quadrajet logo. 1968-88 Carburetor number is stamped into drivers side of main body casting directly above the secondary throttle shaft. Two digit plant code and four digit julian date (DDDY) may also be stamped in main body casting after carburetor number. Note: Casting numberrs cast in small circle are of no help to identify carburetor number. Aluminum tag attached to airhorn screw. If tag is missing, sometimes a partial carburetor number MAY be stamped into carburetor body.